The cold rages on. So publishing something that was sitting in my drafts folder for a while. Funny the things you notice when you stop to sketch them. I have walked by this fountain hundreds of times over the last 7-8 years going to all the little shops in this shopping center on Davis Road. It holds my current hair stylist DJ & Co. , The Inner Bean – a delicious local cafe where I sketch alot and Consigned for Design a terrific homegoods consignment store. I don’t think I truly looked at it or should I say slowed down enough to look at the fountain as I walked by to meet a friend for lunch or get my hair cut. I did this time. 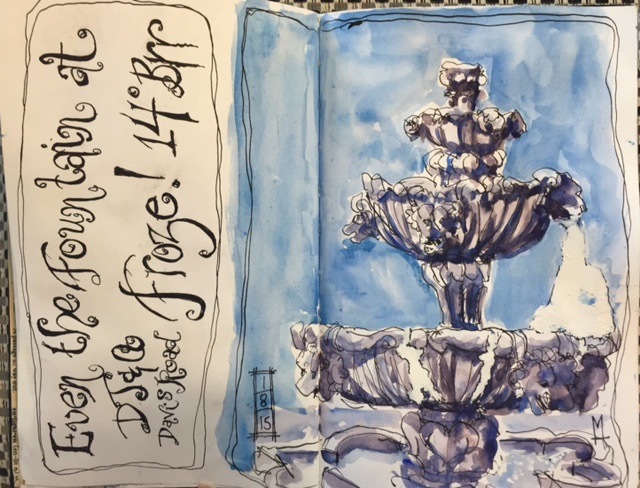 I ended up drawing it twice because the fountain outgrew the page! When you are drawing you notice every little detail trying to capture whatever you are drawing. You aren’t thinking about a thing other than whatever you are drawing at the time. Really odd when you think about it- never to have noticed the details of this really quite lovely fountain sitting in the middle of a parking lot- an oddity to begin with right? I drew it again and once again it almost didnt fit on the double page!! OOPS!! I really need to learn to use some dots first to figure out the layout…one day I hope!! I also decided to paint the words section on the first fountain yellow to give it some contrast. Picking the complimentary color is usually a winner…guess I should have gone with orange! For some reason I went with yellow…Aureolin Yellow…too strong for the soft Cerulean blue background. I could have lifted it off but the ink would have run…not a good thing! 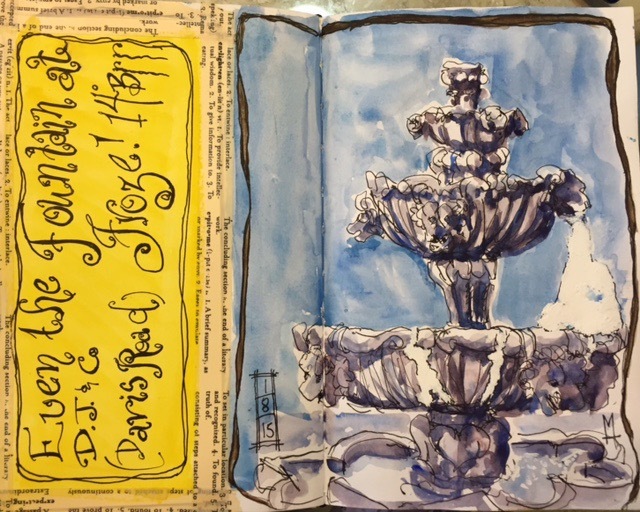 Colors used to paint the fountain Daniel Smith Piemonite and cobalt or ultramarine blue. The background is cerulean. In the second drawing I had alot of running of the ink because YET again I lettered it BEFORE I painted the background. Grey skies are a bit boring in January so I mixed some Winsor Permanent White Gouache with Cerulean and painted over the greyed out Cerulean. 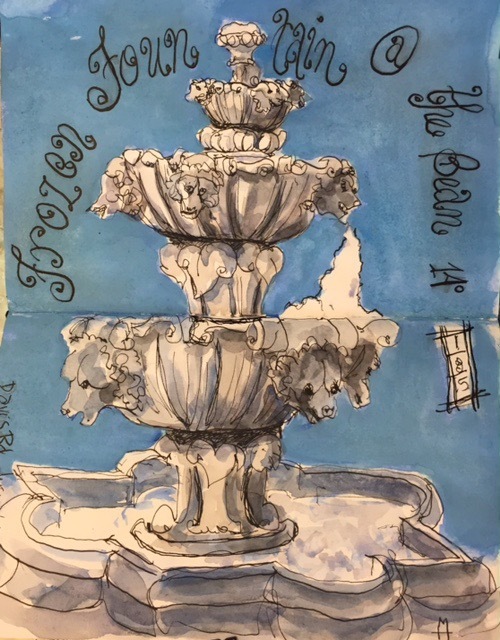 The fountain is painted with burnt umber and burnt sienna combined with cobalt or ultramarine blue for lovely greys.